With a payload of up to 1.9 lbs., the MS-PRO has the ability to stabilize a wide range of today’s popular mirrorless cameras such as the Sony a6300, Sony a7SII, Panasonic GH5 and even cameras as small as a GoPro or smartphone. *Smartphone adapter not included. Lock Mode will allow the camera to hold a certain direction, and will not follow, pan, or tilt. Pan-Follow Mode allows the gimbal to follow pan axis, and hold the tilt position. Follow Mode allows the camera to follow both tilt and pan directions. 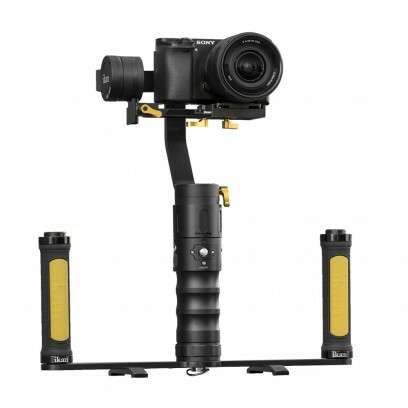 3-Axis Follow Mode has no restrictions as it allows the camera to follow pan, tilt, and roll. Shipping Dimensions: 16 x 10 x 6 in.